Well, well. Another month, another wine delivery. As spring is now really looming around the corner, I found this brilliant Pet Nat with its very flowery label from Austria. And after a lot of convincing and waiting I got the German king of Silvaner to send me some bottles from a small batch. And if spring might become winter again, I have you covered with an excellent red wine from an Austrian farm. When Stefan saw an ad for a small parcel of land in a local newspaper he immediately fell for it and started his very own idea of winemaking. After two years in Burgenland, he came back to his home and took two more parcels to elevate the grape of Franconia to new heights. He farms about five hectar in a region which historically was one of the most famous for wine in Germany. His wines are more akin to Burgundy or Jura whites than anything that is being made around him by big nondescript wineries. He works bio-dynamically and uses small amounts of sulfur. We had an extended conversation about the label for this wine, as it is the same as for his entry-level Sylvaner. However, this one is a tiny batch of bottles made in smaller barrels than he usually uses for the Sylvaner. As he puts it, this results in more balance and depth for the wine. The grapes were pressed directly with no skin contact, and the wine was left for 12 months in the barrel. It’s amazingly low in alcohol and will smell a little like apple peel and herbs. In the mouth, you will have a very salty medium acidic wine that screams for lighter dishes like sushi or pasta with clams. 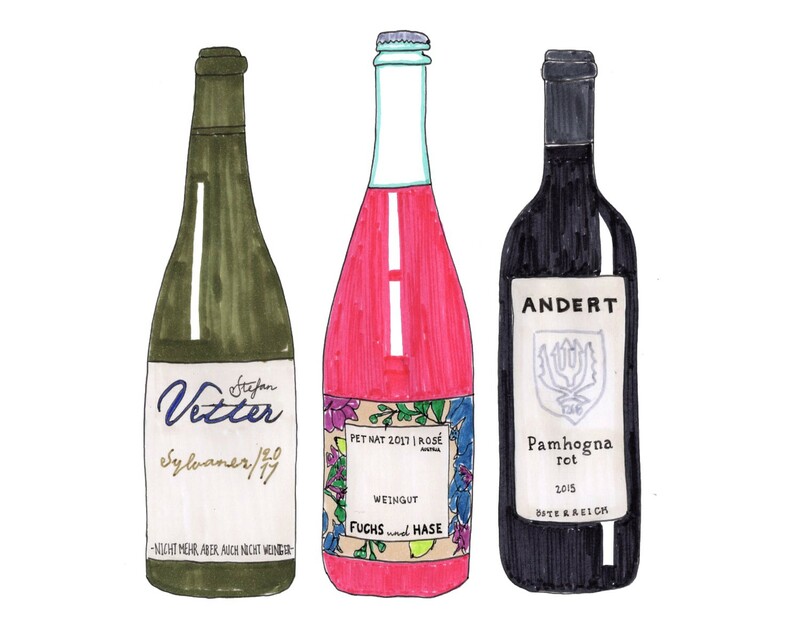 When coming back from working and traveling abroad, the two winemaker couples decided to make Pet Nat like they’ve been drinking in Australia and the US; they started their own company to focus on this historical method of making sparkling wine. I think Stefanie & Alwin Jurtschitsch and Anna & Martin Arndorfer made the right decision. Every year they release different volumes of their Pet Nats from different grapes and vinification methods, but always without any additives and all made with grapes from sustainable farming. Interestingly, the wine was made with Zweigelt pressed as Rosé and later the skins of Cabernet Sauvignon were added to the fermenting juice. Once there was enough sugar eaten by the yeast, it was filled into bottles and stored to finish fermentation. It got some rest in the bottle and was disgorged, but will still have some yeasty flavors, which makes it a little creamier and even more tasty. It’s a perfect aperitif and also works well with anything sweet. The two brothers Erich and Michael grew up on a farm in Pamhagen near Neusiedler lake where wine was just one part of the production. Nowadays they mostly focus on wine, and they’ve been farming the 4.5 hectares bio-dynamically since 2003. To fertilize only manure from their animals is used. Everything is very down to earth as they have the cellar right under their house and do the labeling in the garage. As several sources have told me, the cellar is without electricity, and any tasting down there is done with candles — next time I want to see this. As a blend, this red wine had some time to mature in this very cellar. After 7 to 20 days it was pressed and left in the barrel for at least two years. Without filtering it was bottled by hand and finished with a little bit of sulfur. You should definitely open this a little bit in advance, ideally one day ahead of time. With some smooth tannins and darker and spicier notes of blackberry, this should be an ideal steak wine. Head drinker at Plain. Disciplined designer. Pragmatic consultant. Assorted geek. Liberal foodie.